June 2, 2017 – Boston, MA – The Environmental Business Council of New England (EBC) is pleased to announce that the XSS Hotels Brownfields Project is the recipient of the 2017 EBC James D.P. Farrell Award for Brownfields Project of the Year. The rise of this particular development brings full circle what started as a ruinous debris pile after a major fire leveled an entire City block in Chelsea in May 1974. The City of Chelsea Economic Development Board (EDB) acquired the 1.2 acre property in 1999 as part of a larger redevelopment strategy for the area adjacent to Route 1. While the area’s proximity to Boston and the improving economy allowed all other parcels to be redeveloped, this property was unable to be sold or redeveloped due to widespread elevated concentrations of PCBs in soil. 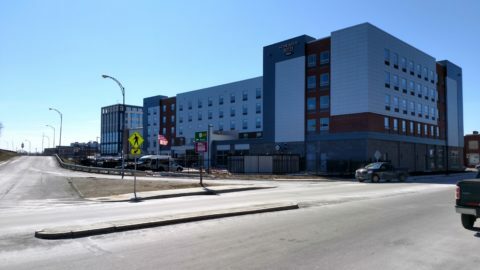 However, the vision and persistence of XSS Hotels and PROCON, with additional support and cooperation of team partners including the City of Chelsea, the Chelsea EDB, the U.S. EPA, MassDEP, and MassDevelopment, resulted in the successful remediation, capping and redevelopment of the site. The hotel, which opened in March 2017, added over 60 permanent jobs, mostly hired from the local community, and will provide a consistent source of state and local tax revenue. Each year, the EBC recognizes companies, organizations and individuals for outstanding environmental and energy accomplishments in the promotion of a sustainable, clean environment through the EBEE Awards Celebration. These awards were established by the EBC to encourage companies, government agencies, non-profit organizations, and environmental professionals to serve as models for others to emulate and, in doing so, further the mission and objectives of the EBC. James D.P. Farrell (1958-2004) actively participated in the EBC Brownfields Committee and Brownfields programs while at the Massachusetts AG’s office where he was chief of the brownfields unit. He was instrumental in making the brownfields redevelopment process work in Massachusetts and was often involved in delicate negotiations among developers, municipalities and former owners of contaminated sites. Jim was admired for his work on complex Superfund negotiations – including negotiations in New England. As a DOJ attorney on the General Electric Pittsfield case, Jim’s ideas during negotiations helped parties reach an unprecedented settlement. Jim’s work for the AG’s office strengthened the partnership between EPA New England and the state. He was a valued member of the South Weymouth Naval Base case team, where he helped bring together representatives of the business, environmental and military communities for site cleanup and redevelopment. Prior to 1999, he worked in the environmental enforcement division at the U.S. Department of Justice and as an aide to U.S. Senator Warren Rudman of New Hampshire. The XSS Hotels Brownfields Project will be honored at the Annual EBEE Awards Celebration on June 8 at the Marriott Copley Place Hotel in Boston, Massachusetts.